Mixing water and electricity is just part of the job. Having the right tool for the job is important in any profession or trade. Chefs need sharp knives, house painters need high-volume sprayers and plumbers need adjustable wrenches. The same rule applies to fisheries biologists. To effectively assess the status of Utah’s fish populations, we often use electrofishing, and it’s just what it sounds like: fishing with electricity. This DWR crew is using backpack electrofishing equipment to survey Temple Fork. Most parents (mine included) teach their children at a young age that water and electricity don’t mix, but that combination was exactly what attracted me to a career as a fisheries biologist. In one of my first college biology courses, we assisted a DWR biologist who was conducting an electrofishing survey on a nearby stream. It was an incredible experience, and I’ve been hooked ever since! The following year, I landed a summer job with that same biologist. 1. Electrofishing equipment varies in size and strength. It can range from small, battery-powered units housed in backpack frames to more powerful units mounted on boats with large generators. 2. We use the electrofishing unit’s positive and negative electrodes to apply an electrical current to the water. 3. When fish encounter the electrical current—which stays within a relatively small area around the probes—they are stunned and unable to swim away. 4. We use dipnets to capture the stunned fish and then work quickly to measure, weigh and assess them, before returning them to the water unharmed. The electrofishing equipment we use often depends on the size and type of fishery we’re sampling. We rely on boat electrofishing along reservoir shorelines and raft electrofishing in the larger rivers (the Colorado, for example). On medium-sized, wadeable rivers, we deploy our canoe or tow-barge units. The Green River is one of Utah's premier trout fisheries. And then there’s backpack electrofishing. The majority of my experience has been of the backpack variety, which I’ve used to sample trout or other fish in small streams. As long as you follow safety precautions and use the proper gear, electrofishing is generally safe. Until about a year ago, most of my electrofishing work occurred on small streams with a backpack shocker during daylight hours. The risks were minimal—no big deal. Then, I transferred to the Flaming Gorge Project. This is where things became a little more interesting. To effectively sample fish in the Green River (below Flaming Gorge Dam), we use an extraordinary combination of boat electrofishing in flowing water. And, on top of that, the whole sampling project happens at night. It’s particularly stressful for the boat operator, who must keep the boat steady for the electrofishing crew while watching out for rough weather, shallow areas and the large boulders that lurk just below the river’s surface. I get a knot in my stomach just thinking about it! In September, we completed our fall survey on the Green River. We electrofished on two nights at two different sites. One was just below the dam, and the other was about seven miles downstream at Little Hole. After each transect, we shuttled the captured fish back to the launch ramp, where they went into holding cages to await their turn on one of the two data tables. 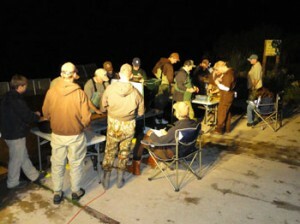 The Green River survey crew processed hundreds of fish in September 2011. It was a big effort, requiring at least 17 volunteers. Some of the volunteers supplied fish to the processing tables, while others identified fish and checked for fluorescent markings on the stocked rainbows. There were a couple of people who spent the evening measuring and weighing fish, while others checked for previously implanted electronic tags (or inserted new tags). We also had people recording data and working on the boat. Despite drifting into submerged rocks downstream of Little Hole (again, sorry Lowell and Jack! ), we completed the 2011 survey without any mishaps. For a better idea of what an electrofishing project entails, you can watch last year’s Green River survey at http://www.youtube.com/UDWR#p/u/19/3KIC6HvZXnU. So, why do we do it? Well, for one thing, it’s thrilling to see all those fish! When the “juice” is on, so many fish pass through the headlights that our netters can capture only a small fraction of the total—five percent, at best. To put it in perspective, the Green River holds about 15,000 trout per mile between the dam and Little Hole. Handling several hundred fish—including some tagged fish that we’ve seen before—and recording all the data we collect, allows us to assess the individual growth and overall health of the fish in the river. We use the information to evaluate current management practices and to determine if changes are necessary. If it sounds interesting (and a bit risky), it is. But if mixing water and electricity means that I get to handle more fish, it’s definitely worth it! Thanks for your question, Chance. We frequently recruit volunteers, including Dedicated Hunters, to help with field work. Check the DH Project web page (wildlife.utah.gov > Hunting > Dedicated Hunters > Service Projects > DH/Volunteer Project page, or contact the Division office nearest you to inquire about volunteer opportunities.